Orlando Magic vs. Houston Rockets!! Yao Ming is coming!! Yes! $ 10 a TICKET!!! If you never experience a live NBA game before, here is your chance! So far we have close to 70 tickets booked. If you want to see the game, please call Ms. Jessica Fernandez directly at 407-916-2912, and let her know you are with our group (TampabayCAAT) for getting the same discount rate on ticket. Any questions, contact JC at 813-907-7715. Thank you. General Information: Game starts at 7:00 PM on January 8, Wednesday, 2003 at TD Waterhouse Centre-F-K-A Orlando Arena (600 West Amelia St. Orlando). Directions for driving: ---- from Tampa, take I-4 east to Orlando downtown, exit on 83B, turn left on West Amelia Street for 0.3 mile, the Arena is on your left. Sorry we do not offer any transportation for the game, and car pool is recommended. 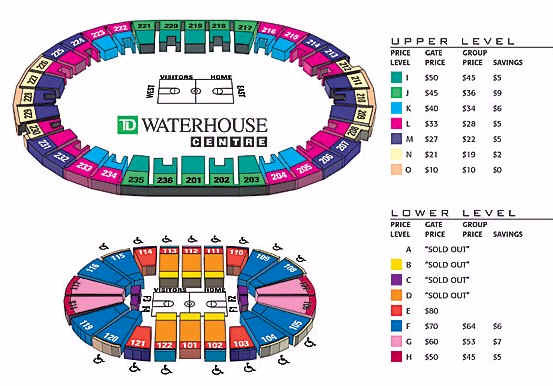 The following are zone and seat map info for you.